Scaffolding on a four foot high structure is surely not period and those clouds look distinctly modern ……. Undone collar buttons and no ties are so not yesterday's look. Paul Kibbey, The Dainton Banker, granmaree and 3 others like this. Paul Kibbey, Another Yorkshireman, The Man of Kent and 1 other person like this. Very good. Now can you make it look like it was taken on film - Kodachrome 64, for example? Kodachrome 25 surely. Complete with the blacks in dark green. Paul Kibbey and Colin Allcars like this. Ok, Kodachrome 25. And don't call me Shirley. Paul Kibbey and Rumpole like this. Paul Kibbey and staffordian like this. 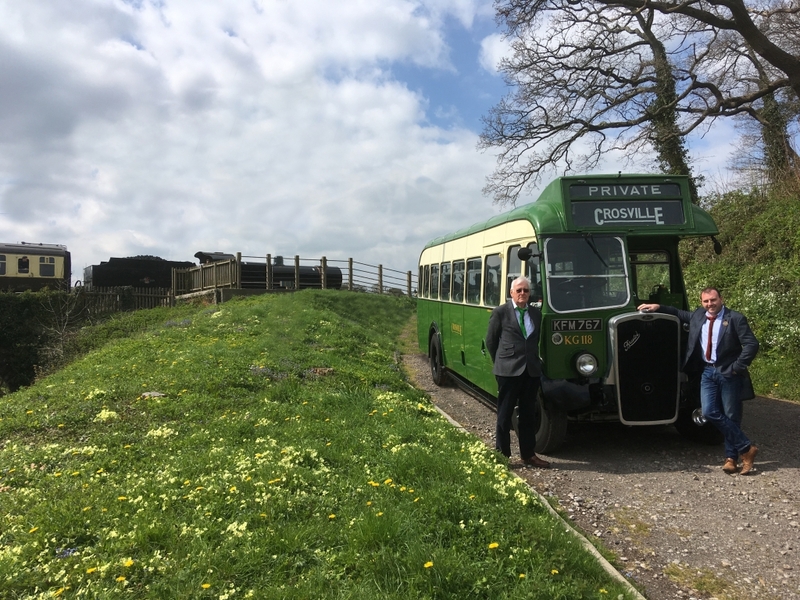 West Somerset Railway reopens fully on Good Friday - 19 April 2019. As has been widely reported, the WSR has had a bit of a tough winter, but its people have dug in and it fully reopens this Friday to Minehead. Please help get the message ‘out there’ in any way you can. And why not stop by for a ride? The weather forecast is good, particularly for Easter Friday and Saturday, 19/20. The poster is held by WSR Commercial Officer Sam White, who designed it. johnofwessex, green five, gwalkeriow and 11 others like this. Vastly better than brown trousers. "When all the rest wore decent black..."
Paul Kibbey, Robin Moira White and staffordian like this. Are these posters for sale in the shop? A smaller version suitable for home use. Only £3. Good news about loco 9351 announced to WSRA members at the AGM today. Yes good news indeed. 9351 has shown that if you engage with givers and show progress then they will get behind a project. Lets hope the grant from the Great and Ancient is the shot in the arm for 4561 and folks get behind it thus maintaining momentum. Paul Kibbey, Geoff May, Paul42 and 2 others like this. Good marketing ideas - something that has been distinctly lacking up unto now and something which needs to change! So easy to knock, knock, knock. Well try the below, which has gone to 6,000 plus Hinkley workers and their families in their house newspaper in the last day or so. I had a small role in making the connections but the hard work in achieving this was done by the unfortunately departed WSR Commercial Mark Hill and finished off by Sam White. The first tickets have already been sold. mvpeters and West Somerset Wizard like this. The Man of Kent likes this. I think it depends on how you read it! Paw Patrol is Friday & Saturday & I can't imagine the entire train will be reserved. Normal service resumes on Sunday & Monday on the Blue & Red tt's. Well, try the below, which has gone to 6,000 plus Hinkley workers and their families in their house newspaper in the last day or so. No discount for the 11-17yr-olds? Seems a bit odd.